302 pages | 29 B/W Illus. Heritage and its economies are driven by affective politics and consolidated through emotions such as pride, awe, joy and pain. In the humanities and social sciences, there is a widespread acknowledgement of the limits not only of language and subjectivity, but also of visuality and representation. Social scientists, particularly within cultural geography and cultural studies, have recently attempted to define and understand that which is more-than-representational, through the development of theories of affect, assemblage, post-humanism and actor network theory, to name a few. While there have been some recent attempts to draw these lines of thinking more forcefully into the field of heritage studies, this book focuses for the first time on relating heritage with the politics of affect. The volume argues that our engagements with heritage are almost entirely figured through the politics of affective registers such as pain, loss, joy, nostalgia, pleasure, belonging or anger. 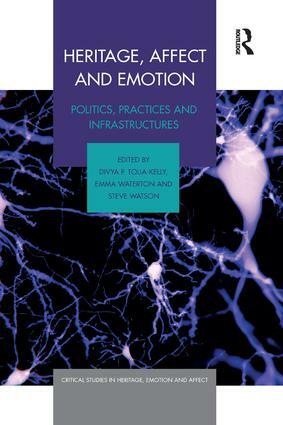 It brings together a number of contributions that collectively - and with critical acuity - question how researchers working in the field of heritage might begin to discover and describe affective experiences, especially those that are shaped and expressed in moments and spaces that can be, at times, intensely personal, intimately shared and ultimately social. It explores current theoretical advances that enable heritage to be affected, released from conventional understandings of both ’heritage-as-objects’ and ’objects-as-representations’ by opening it up to a range of new meanings, emergent and formed in moments of encounter. Whilst representational understandings of heritage are by no means made redundant through this agenda, they are destabilized and can thus be judged anew in light of these developments. Each chapter offers a novel and provocative contribution, provided by an interdisciplinary team of researchers who are thinking theoretically about affect through landscapes, practices of commemoration, visitor experience, site interpretation and other heritage work. 13. "Please Mister President, We Know You Are Busy, But Can We Get Our Bridge Sorted?" Divya P. Tolia-Kelly is Reader in the Department of Geography at Durham University, UK. Emma Waterton is Associate Professor in the Geographies of Heritage at Western Sydney University, Australia. Steve Watson is Professor of Cultural Heritage at York St John University, UK. This book series, edited by Divya P. Tolia-Kelly and Emma Waterton, is dedicated to Professor Steve Watson. Steve was a pioneer in heritage studies and was inspirational in both our personal academic trajectories. We, as three editors of the series, started this journey together, but alas we lost his magnificent scholarship and valued counsel too soon. The series brings together a variety of new approaches to heritage as a significant affective cultural experience. Collectively, the volumes in the series provide orientation and a voice for scholars who are making distinctive progress in a field that draws from a range of disciplines, including geography, history, cultural studies, archaeology, heritage studies, public history, tourism studies, sociology and anthropology – as evidenced in the disciplinary origins of contributors to current heritage debates. The series publishes a mix of speculative and research-informed monographs and edited collections that will shape the agenda for heritage research and debate. The series engages with the concept and practice of Heritage as co-constituted through emotion and affect. The series privileges the cultural politics of emotion and affect as key categories of heritage experience. These are the registers through which the authors in the series engage with theory, methods and innovations in scholarship in the sphere of heritage studies.